With the increased popularity of St. Martin/ St. Maarten, so too have the flight options increased. Noted below are direct flight options. Nearly all direct flights out of Canada are through Toronto Pearson International (YYZ). Some airlines also fly out of Montreal (YUL), as noted below. * Please note that all flight information is from outside sources. As such, information can change at any time. Please check your local carrier for up-to-date flight details. Get there faster. Start your vacation sooner. 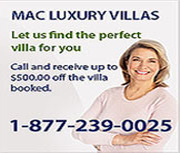 We have the villas to make your vacation perfect.